Joseph left home at 15 and couch-surfed for five years. He looked up “homeless youth” on the Internet and found Covenant House. He wants to start his own record label. Photo credit "Almost Home" by Kevin Ryan. All rights reserved. Kevin Ryan President and CEO of Covenant House International. 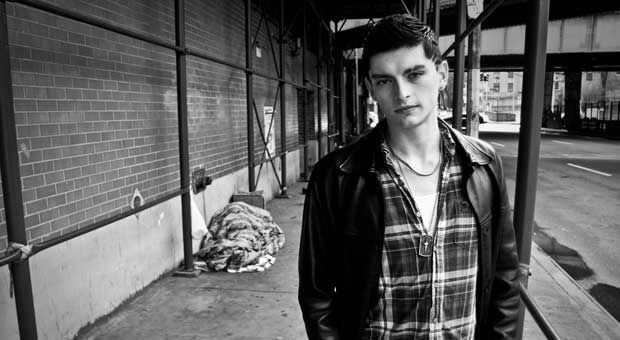 "Paulie Smith" Former homeless youth profiled in "Almost Home." Cory Booker Mayor of Newark, N.J.
Excerpt from “Almost Home: Helping Kids Move from Homelessness to Hope” by Kevin Ryan. Copyright 2012 by Kevin Ryan. Reprinted here by permission of Wiley. All rights reserved. MS. DIANE REHMThanks for joining us. I'm Diane Rehm. Kevin Ryan leads Covenant House, the largest network of shelters for homeless youth in the U.S. Each year, nearly two million young Americans end up on the streets, and that number is growing. Many are forced out of their homes by violence and abuse, only to suffer worse fates on the street. But with help, they can rebuild their lives. Kevin Ryan is the co-author of a new book titled "Almost Home" about six young people who overcame terrible adversity. MS. DIANE REHMKevin joins me in the studio. You're welcome to be part of the conversation. Give us a call on 800-433-8850, send us your email to drshow@wamu.org, follow us Facebook or Twitter. Good morning, Kevin, it's good to meet you. MR. KEVIN RYANThanks for having me, Diane. REHMKevin, I know you went to Georgetown University here in Washington D.C. What got you first involved with homeless children? RYANWell, at the time, I was riding around in a street outreach van here in the city in the P Street circle and in Anacostia, and it opened my eyes to the number of kids who had nowhere to go, who were living on the streets at night, even as the temperatures dipped and darkness loomed. These were kids who at all hours of the day and night were riding metro cars, staying in all-night donut shops, and I wanted so much to be a part of that healing for those kids. RYANI wanted to be part of that movement of people who helped kids get across the bridge from poverty to hope and opportunity. REHMSo as you saw them, how did you become more and more involved with them? RYANWell, at the time, my girlfriend, who's now my wife, was volunteering at Covenant House in New Orleans. She did a year of service with homeless young people in the French Quarter, and I would visit her on breaks from Georgetown Law School and was riveted by the ways in which the young people inhabited her heart by the ways in which she was growing, both spiritually and personally, and it made me so much want to be part of this work. RYANSo when I left Georgetown Law School, I was able to -- and lucky to get a Skadden fellowship and worked for a couple of years doing legal aid work with young people in Times Square. REHMWhat were the kinds of legal issues you were encountering? RYANAll different issues. Young people who had been trafficked and were being exploited, young people who were, you know, being held in various processes because their parents had abandoned them or because they were homeless young people who were being pursued by truant officers and the real issue wasn't truancy, the real issue was homelessness. So a whole variety of grass roots poverty law issues that created a new set of hurdles for kids. REHMI think there are a lot of people who wonder how it is that kids become homeless. Do they simply run away? Do their parents tell them to leave? What happens? RYANWell, at Covenant House we're working in six countries with tens of thousands of young people every year, and the vast majority of those young people have no choice whatsoever. They're young people whose families imploded, could be because of drugs, could be because of poverty. It could be because a parent died. It could be because of abuse and neglect. Most of the young people who walk in the front door at Covenant House have endured very serious abuse. RYANAnd their movement out to the streets to wherever it is that they live, lots of young people live on the Hollywood strip, or they live under the boardwalks in Asbury Park and Atlantic City, or in Town Square in Toronto. Those young people are there because there's no other place for them to be. No kid chooses to be in the cold in the middle of winter, sitting on a stoop. So there -- it's a choiceless movement for young people onto the streets, and we're trying to get them safe and get them inside. REHMSo you're saying they're not really runaways? RYANI never use the word runaway, because I think that it mischaracterizes what's happening for young people. I, you know, there's this mythology that kids run away to New York City to be the next Broadway star, or they run away to Hollywood to be the next "American Idol." It's just not true. The young people who are there describe stories of profound, almost unspeakable, abuse, being exploited, abandoned, and they desperately, desperately want to believe in themselves, but no one's given them that message. They feel so alone in the world. REHMHow do they start out? How do they begin life on the street? RYANFor a lot of young people, it's not a choice. They'll end up in a moment of crisis. It could be their family has been evicted, or that their house was foreclosed upon. It could be that they were removed from their parents' custody and they moved from place to place to place. One of the young people we write about in the book endured 35 different foster care placements, and then at the age of 18, the Texas Child Welfare System graduated him out the door. RYANThere are more than 26,000 young people every year who leave public child welfare systems in the United States to nothing. To no family, no guardian, no forever anything. It's just the streets. REHMAnd what about the younger kids? How do they get out there on the street in the first place? RYANYou know, the first very young person I met was in October of 1992. I was in the Amtrak tunnels in New York City doing street outreach work, and there was a pregnant 13 year old in there who eventually came into Covenant House, and she described ritual sexual exploitation by a stepfather, a drug-addled and desperately dysfunctional mom, and she eventually hit the streets because home was just night after night after night of sexual abuse, and this guy who she thought was her boyfriend, was her pimp, and ended up offering her the warmth of a cot inside one of these SRO motels. RYANBut she was then subjected to a parade of loveless Johns every single night until she became pregnant, and then was of no use to him, and she was living in the Amtrak tunnels. That's not atypical. Over the last 20 years I have met thousands of young people who have been treated just as she was. REHMIs the number of young people you see on the streets going up, and if so, why do you think that is? RYANWell, poverty is jugulating in so many ways, and I think that the economic crisis of the last several years, especially the instability of the housing market, and the fact that there are so many kids who are affected by evictions and foreclosures has meant that there are more people without shelter. And the National Runaway switchboard, and our own international hotlines both in the United States and in Canada, which are resources for kids on the street, have had surges in calls as a result of the uptick in the number of young people who are homeless in the United States and in Canada. RYANYou know, that's not to say that we're losing this battle, because I think that there has been progress on many fronts, but it is to say that when things go very bad in the economy, as they have for many families over the last four years, poor, homeless kids fall further and further back in cue, and are at a much more significant disadvantage. REHMHow many kids can Covenant House, say in New York, help? RYANWell, before the hurricane, we were safely at around 275 young people. But once the hurricane struck the Jersey coast and coastal New York City, and essentially demolished lots and lots of housing, leaving a hundred thousand people homeless, our numbers surged, and we're now consistently sheltering and feeding well over 350 young people in two shelters just in New York City. RYANIn the seven shelters in New Jersey, you know, we're serving one-and-a-half times as many young people, and we're starting to grow a wait list. Our shelter in Atlantic City just reopened as a result of the damage it sustained in Sandy, and the worry that we all have is, as a result of the natural disaster, what will we now do to make sure that these kids are safe. REHMHow is Covenant House funded? RYANMost of Covenant House's money is funded privately. So we have to raise centrally somewhere in the order of $65 million a year, and then each of the Covenant Houses have to raise an amount equal to that, so that our international budget is somewhere in the order of $130 million. And we rely on six million donors across the United States, Canada, and Europe who write checks, often from their poverty, not from huge surpluses, but five dollars a month to help us take care of young people, you know, in the 30 cities that we're working in. REHMAnd what about this book. Are you hoping that proceeds from the book will also be of help? RYANThat's right. All of the author's proceeds from "Almost Home" support Covenant House's work, and it's in that way a crucial revenue source for us to help us take care of young people. But I'm also hoping that it opens people's eyes. You know, we very much wanted to reveal the heart and the faces and the voices of these six amazing young people who encountered almost unspeakable violence and abandonment, but somehow managed a way forward that's compelling and, at least in my view, very inspiriting. REHMDo you think that the public really wants to hear about, and know about homeless kids? RYANI think that most people want to know how they can help homeless young people. I don't think people want six stories of despair that leave us all feeling bad about ourselves and feeling terrible about the plight of homeless young people. But I do think that people want to know what can I do. Whenever I get together with an audience, whether it was here last night in D.C. or the night before in Anchorage, or the night before that, it's fascinating to me how many people ask the same question. What can I do to help? RYANAnd this book was a very intentional effort by Tina Kelly, my co-author, and I to give people a robust menu of items and activities that they can engage in to help. REHMShe, being with the New York Times. RYANTina worked with the New York Times for ten years. She shared in a Pulitzer Prize for the paper's 9/11 coverage, and she, three-and-a-half years ago embarked on this project with me to meet six -- first it was eight, but eventually six homeless young people across Canada and the United States and then reveal in some depth their life stories. REHMKevin Ryan. His new book co-authored with Tina Kelly is titled "Almost Home: Helping Kids Move from Homelessness to Hope." And the forward was written by Mayor Cory Booker of New Jersey, and he'll be on the phone with us in just a few moments. Stay with us. REHMAnd welcome back. Kevin Ryan, who's president of Covenant House, is with me together with Tina Kelley formerly of the New York Times. He's written a book titled, "Almost Home: Helping Kids Move from Homelessness to Hope." And in this book he's written about six young people who have faced the challenge of homelessness, who have come through Covenant House and have been helped to regain their lives. REHMJoining us now from Seattle, WA is Paulie, one of the six young people featured in the book. Paulie, good morning to you. MR. PAULIE SMITHGood morning, good morning. REHMI'm so glad to have you with us. Talk about why you left home. SMITHSo why did I leave home? SMITHI don't feel like it was necessarily a choice. I think that it was, do I want to live or do I want to be, you know, mentally and physically destroyed for, you know, the next few years. And, you know, I tried to leave before because things got bad, but I didn't really actually have the mental capacity until I was 13, almost 14 years old to finally stay gone. REHMAnd tell us what conditions were like in your home before you left. REHMTell us what conditions were like in your home before you left. SMITHOkay. Well, let's see, I'll give you an example. I don't know if it's in the book. But when I was maybe four years old, one of the earliest memories that I have is of my dad, the adoption dad, when the foster parents that I was in got mad one day and I don't remember what for, I don't what was going on, but he started screaming, started beating at my mom. And then everything broke out, I was scared. I didn't know what was going on. SMITHAnd he went into his -- he was a big gun collector, so he went into his room and grabbed a gun. It was a big, huge, silver gun, and he gave it to me and I thought he was going to, you know, maybe shoot me first. But he gave it to me and then kneeled down in front of and I was in front of the closet. And I remember the carpet, I remember the cold air around me. I remember the weight of the gun, and then he put the gun in his mouth and said, you make the choice. If you think that I'm evil and you think that I should die, you need to make the choice. SMITHI was either four, five or six. And so that's one of the first experiences that I've had. And from then, it was just continuous, you know, anger and mental abuse and emotional abuse and just, you know, going to school with bruises. And, you know, my teacher asking me what's wrong and then, you know, me telling them that everything's fine. You know, it's marks from playing or marks from sports. REHMI gather you were finally arrested for shoplifting and tried staying with a friend, but then the friend's mother called the police and you were taken to Covenant House in Anchorage. But before you got there, tell us, if you can, about the worst days you had on the streets. SMITHI mean, before I went to Covenant House I wasn't necessarily on the streets yet. I went straight to my friend's house and then they took me to Covenant House. And then I started to, you know, lash out a little bit. And I didn't really want to listen, I didn't really want to, you know, follow the rules. And Covenant House didn't really understand. Although, you know, as nice as they were, I just wasn't ready. SMITHYou know, I wasn't mentally -- I was just lashing out. And some of the worst streets that I've -- some of the worst nights that I've had was, you know, I had to rob certain people for money. That was some bad nights. I feel really bad about that. Sleeping on the streets was pretty bad. Eating out of trashcans, like I would go to school, you know, I would try to stay in school. And I would go to school and when I would get off, I would, like, try to find food somewhere. SMITHAnd I would eat out of a trashcan and, like, somebody from school would see me and that was a little bit hard to deal with. And then being made fun of for the clothes that I was wearing, being bullied around and things like that, for being poor or for being unattractive or things, that was really hard. REHMAnd without the shelter, where do you think you'd be now? SMITHOh, I don't know. Not where I am today, that's for sure. SMITHAnd where are you today? REHMYou are now 28 years old. You have a job. SMITHI feel like I owe it to everybody, you know, to the place that I'm from, to the schools that I went to, to the teachers, to Covenant House, to my job. I feel like I owe everybody all the time. I'm always gracious and always thankful because 10 years ago I wasn't. REHMWell, Paulie, I'm delighted that you could join us this morning and especially thankful with you that you've made it. Take good care. SMITHI hope that -- I want to thank Kevin Ryan. I know I haven't seen him in a while and Tina Kelley for spending the time with me. It was really great. And thank you so much for having me on the show. SMITHI hope that that helps you or whatever, you know? REHMIndeed. And we hope it helps other young people. Thanks for joining us, Paulie. And with us now is Cory Booker, mayor of Newark, NJ. He wrote the foreword for "Almost Home." Good morning, Mr. Mayor. MR. CORY BOOKERGood morning. Thank you for having me on and thank you for having this conversation. REHMWell, I'm so glad to be with Kevin and to be with you. Tell me about homeless kids in New Jersey. BOOKERWell, it's far more of a problem and a concern than people realize. And one of the things I love about the book is it started to wake people up, not just to the problem but that there is hope and that intervention can take a situation from being one of a grievous waste of national resources of country, which is not oil or gas, it's our children and go from wasting that to empowering those young people, their minds, their brilliance, their beauty to make an impact that benefits all of us. REHMAnd this is actually very personal for you, isn't it? BOOKERWell, you know, as I wrote in the foreword, I know that my father would have likely become homeless. He had a home situation that was his family could not take care of him. And if it wasn't for the intervention of people in his small town, specifically one family, but really he had, I would call it conspiracy of love around him of people that would not let him fall through the cracks, I wouldn't be here today. BOOKERSo, I know the power of small interventions, the power of kindness and I feel like I owe my very existence to that legacy. REHMIndeed your father, thanks to the kindness of strangers, your father went on to get a college degree. BOOKERYeah. You know, in fact it was last Thanksgiving that one of the most poignant time for my dad talked about the story because he now suffers from Parkinson's, he was upset as we're going around the table saying we are thankful for, you know, talking -- he couldn't remember the names of the people who gave him dollar bills just to help him pay his first semester tuition. You talk about return on investment, I don't know if those people knew that they were changing -- they're affecting children yet unborn. BOOKERBut that's the power of kindness. I always say the biggest thing you can do in any day is a small act of kindness, because it really do change destinies and outcomes. And taking time to be aware of the young people around you that might need help, being aware of places like Covenant House that are helping to do such powerful interventions and empowering the destinies of kids, we all have so much more power than we actually use every day to make the difference and make an impact. REHMAnd, Mayor Booker, what about the Storm Sandy and how that has affected not only homeless children, but created a whole new population of homeless in New Jersey? BOOKERRight. When you have such a devastating storm that the aftermath of which is still felt, when you have days and days of people without power, people who burned through their savings, people who lose their basic necessities and aggravates any kind of problem or stress, it just makes it so much worst. And that's what we're seeing across New Jersey, from the wealthiest of towns to towns that are struggling. BOOKERAnd so, you know, this is something that we've all, as a community, have to deal with. And I have to say I'm very grateful to see how social media is working. I put a post up from LinkedIn and had some of the founders and leaders of that company join me in an effort to raise money for Covenant House because organizations like that get so much more demand, gets a wave of demand that they're often unable to meet unless they have the generosity of others that are stepping up. REHMCory Booker, mayor of Newark, NJ. He wrote the foreword to the book we're talking about. It's titled, "Almost Home." Mayor Booker, thank you for joining us and thank you for trying to deal with the challenges you're now facing. BOOKERNo. Thank you very much for including me. And, again, this show is bringing light into the darkness and helping to illuminate what I believe is a very good pathway forward for us all. REHMThank you so much. Mayor Cory Booker of New Jersey. Well, Kevin Ryan, you've got an awful lot of people out there who are clearly affected by the work you're doing and clearly need you to speak out for them. RYANWell, it's a privilege. You know, that work that we do is not about the shelters, though I don't say that dismissively, especially in light of the hurricane. It's about the movement. It's about people inside and outside of Covenant House, who want to be love in the world, who want to be hope in the world for these young people. The truth of the matter is, listening to Paulie a few minutes ago reminds me of how modest he is. RYANHe went on to become -- he went from this experience of arctic homelessness through all of his teen years to become Alaska's kickboxing champion. And he did that not just because lots of people inside and outside of Covenant House were cheering for him, he did that because he wanted so much to realize this big dream. I think that those big dreams are what inspire all of us. REHMAnd you're listening to "The Diane Rehm Show." We have a great many callers and we'll open the phones now. First to Brown Summit, NC. Good morning, Gay, you're on the air. GAYGood morning, Diane. And I wish you had run for president. REHMThank you. I think I have a big enough job right here. GAYI wanted to say to the speaker, I didn't hear him mention anything about gay kids, gay young people who are very often told to get out of their parents' homes. These children, they haven't anything wrong. They have an orientation, which is a little different but their parents have kicked them out, close-hearted, close minds and they're out there on the streets with all the other problems that they have and they are homeless. REHMAnd indeed, Kevin Ryan and Tina Kelley do write about that very issue in their book, "Almost Home." Kevin, how often does sexual orientation play a role here? RYANOh, very often. There are so many young people who, when they come out, are greeted with hate and rejection. We write about one of the kids who, at the age of 17, got kicked out by her family in California and had to fend for herself because she's gay. Her grandmother and her mother who were very sporadic in her life forced her out because they were so angry at her. In fact, when she came out to her mother, the next thing her mother did was smack her across the face. RYANAnd this is not one story. There are cities where more than 40 percent of the kids who are on the street are kids who are gay or lesbian or bisexual, kids whose hearts tack in one direction and their families want them to beat in a different direction. REHMAnd how are they treated on the street? RYANWell, some of those kids are treated horrendously. When I first showed up at Covenant House, I did not know that there were young people who when they came out were forced out of their homes. But that first Thanksgiving, which is 20 years ago now, 20 years ago next week, I was at the Thanksgiving lunch at the shelter and there were three boys there. One was 16 and two were 15, and they were back then Boyz to Men was a very popular group and they were singing these pop songs. RYANI sat down with them and I asked them what they were doing and they said they were singing the songs they wanted played at their funerals because two of them were HIV positive and one of them had full-blown AIDS because when they had come out, their families had kicked them to the streets and they had then become enmeshed in a trafficking ring where they were getting pimped out in downtown New York City. RYANWhen kids fall, they fall hard and the stakes could not be higher for gay and lesbian kids. REHMI gather it is because they become so vulnerable. They're in need of money. They're in need of ways to feed themselves, and that's when the traffickers pick up on them. RYANYeah. And, Diane, what's even worst is and what's most pernicious about this is that they think there's something wrong with them. You know, they're homeless because someone close to them, the scaffolding of love around them has collapsed and someone has said, as they're hitting the streets, you're broke. You're unwanted. You don't belong in the world. So it's not just that they're hungry or they're cold or they're tired, it's also that they think they're broken. RYANThat they think they're broken. And it's our mission in the world not just to shelter and feed kids, because that's not going to, at the end of the day, help young people to embrace the great promise of their lives. REHMBut at the same time, you heard Paulie say, well, I didn't feel as though I fit in, I didn't want to follow the rules. I mean, it's a difficult transition. RYANIt's so difficult. It's not linear. You know, you take a step forward, you take a step back. The teen years are tough to begin with. I think I probably drove my parents nuts. And now that I have four teenagers, I'm humbled by how challenging it is. Adolescence is a tough time. REHMKevin Ryan, his new book all about helping kids from homelessness to hope is titled, "Almost Home." Short break, we'll be right back. REHMAnd welcome back. If you've just joined us, Kevin Ryan is here. He is the president of Covenant House. That's certainly not only a building, but an organization that helps young people. His new book is titled, "Almost Home: Helping Kids Move from Homelessness to Hope." Here's an email from Toby in Harrison, Maine who asks, "Where does the child welfare system fit into the problems of homeless youth? Shouldn't these kids be serviced and cared for by child protective services if they're under the age of 18? Why are children left homeless and not placed in group homes or foster care if they're coming from abusive or neglectful homes?" RYANWell, there are many cities where young people who are under the age of 18 do, in fact, get brought into the child welfare system. But there are just as many cities where intake stops. And public child welfare isn't interested in opening the door to a 15 or a 16 year old. And once those kids are in foster care, helping them get to a forever family and some stability is a huge challenge and this is one of the front where we are really losing ground. And it's one of the one's I'm very worried about. RYANIn the last ten years the number of children in foster care in the United States has decreased by about 200,000. But the number of young people who are aging out of foster care without a family -- without a forever family -- is sharply increased. Twenty-six thousand kids last year left child welfare systems across the United States with no forever family. And when they have no forever family it's, for many of them, just a few moments away from homelessness because there's no safety net to catch them. REHMHere's an email from Stephanie in Ann Arbor, Mich. who says, "Your guest is on point about children aging out of the foster care system at age 18 who are then left with no permanent family. In Michigan, she says, we have just enacted legislation allowing 18-year-old foster children to remain in the foster care system until the age of 21. This allows them to continue to receive services like housing assistance, continued supervision from a caring adult. They are thus able to pursue employment or continue their education. And, in fact, their futures can be brighter." Are you pushing to keep these young people to age 21, Kevin? RYANAbsolutely. The federal government reimburses states, with recent reform legislation, very significantly to allow young people to stay in foster care until their 21st birthdays, help them get through college, help them find an independent apartment. You know, the thing about Michigan is that the children of Michigan happen to be lucky because their commissioner is very reform minded. She left the state supreme court in order to end her public service career reforming the Michigan child welfare system. But the welfare of children shouldn't hinge across 50 states on the disposition or attitude of an individual leader. We need more political will on this question. And we need it now. REHMHere's an anonymous email and you will understand why. It says, "I just wanted to let your speaker know children from wealthy families are left to fend for themselves. My father went to Harvard medical school and is a neurosurgeon. He repeatedly beat my mother even when she was pregnant. He beat my brothers. My mother finally left him after having four children with him. We were left homeless." RYANOh, God bless her. It's heartbreaking. REHMAnd how do these kids get to Covenant House? And what happens once they're there? RYANIn each of the cities in which we work we have a street outreach team. And they work very aggressively at all hours of the day and night to get into a relationship with young people on the street. So take the Hollywood strip for example, which is one of the last places in the United States where homeless young people are very visibly on display. Our teams will work on the street outreach van in Los Angeles bringing sandwiches, coats and some referral information. And once young people begin to trust us and understand that we really want the best for them, young people will accept that invitation to come inside and get help at Covenant House. But it often takes many repeated trips. RYANWell, young people are wary of what it is that this stranger pulling up in a van has in mind because a lot of the people who kids interact with on the streets are predators. And kids are very savvy about this. So it's rare that we could pull up and offer someone a blanket or offer a kid a sandwich and have them hop in the van right away. That's not how kids survive. They survive by being skeptical and wary. And they have to see us out there night after night after night. And they have to talk with other homeless young people and say who is that? What is Covenant House? RYANBut over time, once they trust us and hear that we're doing good work and that there's a safe place to go, kids come inside the front door. REHMBut once there they don't necessarily stay. RYANNo, that's right. There are many -- in fact, Paulie, who we were talking to earlier today left ten times. It was the 11th time when he just decided, OK, I'm going to stop using X and I'm going to stop engaging in the rave scene. And I'm going to listen to Covenant House with respect to the curfew. There are a lot of young people who have a really hard time with structure, right. And the thing that my parents gave me, and, I think, a lot of parents give their kids is structure. Okay, bedtime is X. You're going to wake up at Y. You're going to go to school. You're going to get a part-time job. RYANKids on the street don't have that structure. And the chaos is infective in some ways. So, as a result of that, we sometimes see young people who come in the front door and who want more for their lives, but aren't ready to walk in consistently at 10:00 P.M. You know what we can't let homeless young people be out on the streets at 1:00 A.M. in the morning. That's when the pimps and the pornographers and the predators lurk. So our policy is to work with kids on an individual basis, but get some structure in their lives. REHMAnd do they go to school while they're at Covenant House? RYANThey certainly can. In Detroit we were invited by the city to actually build schools for homeless young people. And we run one of two sets of charter schools for homeless young people across the United States. In the other Covenant Houses in the United States and Canada young people can either earn a GED through our program or can get their high school diploma, depending on the offering. And there are lots of kids going to college, too. REHMAll right. To Cincinnati, Ohio, hi there, Michael. MICHAELHi, Diane. I just want to say, first of all, what a privilege it is to talk to you all. Like, when I was a kid, there was a lot of lonely times and I'd listen to NPR just to, kind of, make it through the night. And you all really helped me. Like, I just want to say off the bat I appreciate that. MICHAELBut, yeah, I (word?) foster care -- 1998 and I can remember feeling really lucky because a lot of the kids that I grew up, like, I was lucky enough to have a decent education when I went into foster care and bounced around a lot. But I remember what a fight it was, like, a lot of times they'd have you in the group home with there was, like, a mish mash of people that had all these problems. And you'd have to fight, even though you weren't a fighter. And, you know, sometimes it was a blessing and sometimes it was a curse. MICHAELBut I remember when you turn -- I turned 18 personally they basically -- there was a person who was Harvard educated. I don't want to say their name. But in the, you know, the department of human services that basically told me, like, well, you know, you're smart, you get good grades. I was going to college. Like, they did not help me whatsoever. They told me, like, well, we're going to save our funds so people that we know will be exposed as soon as they turn 18. And they're the ones that need the funds and so they kind of left me exposed. And it was really bad. MICHAELBut I kind of took it as an adventure. And so I could go off on a tangent and I could just go blah, blah, blah, blah. But, you know, I -- I can still think now how much -- like, I'm normal now. I was -- I was what someone would see as a normal person, a well-spoken person, a white person, all that kind of stereotypical stuff. But, like, I look around and I don't think people really understand how hard it is to really establish yourself in society. And what it takes to do that and keep that going. And what family and connection and all that stuff really means. REHMSuch an eloquent statement, Kevin. RYANIt's so true. We profile in the book a boy named Benjamin who had 35 different foster care placements after his mother submerged his hands in boiling water. She was arrested. He was removed to child welfare, bounced from group home to residential treatment center to foster home to psychiatric hospital. And on his 18th birthday, as he was graduating from high school, the Texas child welfare system graduated him to the world, all of his stuff in a Hefty bag. And he showed up in the shelter. And, yes, he was hungry. And, yes, he was tired. And he certainly needed a place to sleep. But he thought he was broke. RYAN...Are his connection to hurting kids. REHMMichael, I'm so glad you called. Good luck to you. To Blake in St. Louis, Mo. Good morning. BLAKEGood morning, Ms. Rehm, how are you? REHMI'm fine, thank you, sir. How about you? BLAKEI'm all right. I -- it's a huge honor to get to talk to you today. I've been listening to you since I was 16. And I'm a first-time caller. BLAKEBut I wanted to relate, I guess, a little bit about small town life and how much we need those resources in places like where I grew up in Arkansas because at the age of 14 my grandma and my mom found out that I was gay. And the thing was I really didn't want them to because I had already -- I didn't steal the book, but I was too ashamed to check it out from the library. So I borrowed it without checking it out. It was a book entitled, "Growing Up Gay." And there were so many stories about how people were treated when they came out. BLAKEAnd it ran the gamut from, you know, a mother basically being a little bit aloof about it and saying I always knew that to several kids getting kicked out. And as soon as it happened to me I was so afraid that that's what would happen. And that's what happened. My mom beat the hell out of me that night and trashed my room. She even questioned my little brother and asked him if anything inappropriate ever happened. And she'd never done that with my sisters when she thought I was straight, if you know what I mean. BLAKEAnd it broke my spirit. She wouldn't let me see my brother and sisters again. And she put me out. And then I went back and forth between her house and my grandparents until I was 17. And in my senior year my mom lost her house and I was homeless for two months living out of my car. And had it not been for the kindness of my best friend's mother allowing me to move in, even though I was a boy. And she didn't realize that I was gay. BLAKESo to her she was letting a straight boy move into her house, you know, and share, you know, living space with her daughter. You know, because I needed it. And if it wasn't for them I don't know that I would have graduated high school with honors and gotten a full ride to Washington University here in St. Louis. RYANYou know, it's heartbreaking. I don't know when we're going to learn, Diane. When are we going to learn that you can't -- it's hard. You cannot confront a young person's coming out experience with hate and rejection and violence and expect that that's going to somehow yield love in the world. You're just going to crush their spirit. You're just going to crush them. And then turn them over to all those folks out there who can't wait to devour a broken-hearted kid. REHMBlake, I'm so glad you made it. Thanks for calling. And you're listening to "The Diane Rehm Show." Here's an interesting email for you, Kevin. It says, "How would you envision your program if you received unlimited funds from a generous donor?" And that's from Jack in Charlotte, N.C.
RYANWell, I'd love Covenant House to be in more places. You know, we work in lots of cities in the United States. But we don't serve nearly most of the kids who are homeless across the United States and Canada. And if we had resources we'd be in those other communities. And in the places where we do work there is so much more that I wish we were doing. Some of the Covenant Houses, like in New York and Hollywood, have very fully functioning health clinics. So we're able to be a resource for kids when they're sick. RYANAnd any pediatrician who practices with this group would tell you that the disease profile for homeless kids is quite significant and very worrisome. They look like a population that's much older than 18, 19, 20. But in other Covenant Houses we're not able to provide that level of service. So, if we had unlimited resources, I'd want Covenant House to be a bridge to economic opportunity and healing for all the kids who are out there in all of the big cities and in some of the small cities in which it's a real problem in the United States and Canada. REHMNow is each Covenant House designed pretty much the same? RYANWell, they all have in common a street outreach team, a crisis shelter and then a transitional living program, an apartment program, where either dozens or hundreds of young people can live and develop the skill set that helps them live independently. How to shop, how to save, how to work. But beyond that there are local provincial differences depending on what the need in the community is. RYANSo New York, for example, has a nurses training program. And also has in our regional training center a security training program. So that young people can learn how to become a security guard and then work at hotels or work at office buildings. Young people can work in nursing homes or at hospitals. Panera, the restaurant organization, has a program called Panera Cares in St. Louis in which they hire homeless young people from our Covenant House in St. Louis in an internship that trains them to be managers of the Panera restaurants in St. Louis. Every Covenant House has different partnerships across the country. REHMI'm wondering if these young people, as they apply for jobs, are disadvantaged in any way because they have come from Covenant House. RYANWell, in some ways, they're disadvantaged because they don't have that resume that lots of kids who are competing for jobs have, right. They didn't graduate from a prep school. They're not destined to head to, for the most part, to some of the country's most prestigious universities. But they're hungry and they're ambitious. And the smartest and best CEOs across the United States hire our kids in entry level jobs and train them because our kids have a drive and a desire and a survival skill that's unrivaled. REHMKevin Ryan. He's president of Covenant House. His new book is titled, "Almost Home: Helping Kids Move from Homelessness to Hope." Give us a website address. REHMKevin Ryan, thank you for the work you do. Good luck. RYANGod bless, Diane, thank you.